Jacques Villeneuve only secured his deal with March importer Doug Shierson Racing to run Formula Atlantic a month before the season started but with the most professional team behind him, plenty of sponsorship and a car already sorted by former champion Howdy Holmes, he was expected to go well. His main competition would come from 1979 champion Tom Gloy, who was distracted by taking his team into CART and by running a second car for Rogelio Rodriguez. Gloy only once finished lower than second and had he not missed three races driving in CART, he could have beaten the French-Canadian to the title. With four race wins, including 1-2s over Gloy in the last two races, Villeneuve was a deserved champion. Although still sanctioned by CASC, the series now looked more American than Canadian, with only three of the ten races north of the border. Brian Turner and Chris Pook's SCI brought in a new sponsor for the series, Mamiya Cameras. The Ralt RT1 was still, in Gordon Kirby's view, "the mainstay of Formula Atlantic", but only really because the March 80A proved difficult to set up and the new Ralt RT4 lacked straight line speed. 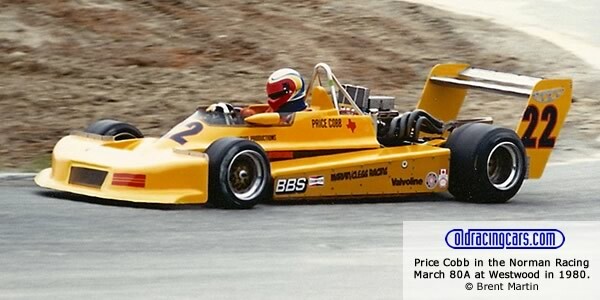 Veteran engineer Charlie Agapiou got Jeff Wood's RT4 going well and Wood won at Bridgehampton, giving Ralt an important boost for the 1981 season. See also Gordon Kirby's seasonal survey in Autosport 1 Jan 1981 pp36-39. Of 229 recorded starts in the 1980 series, 115 were in March cars and 102 in Ralts with only token representation from Chevron, Brabham, Lola and Bobsy.